Chihuahuas are more than just adorable pets. Small but perfectly formed, they often need a lot more love, care and attention than other dogs. That’s why many owners invest in a personal dog carrier. But which is the right one for your Chihuahua? There are many to choose from including carry pouches, tote bags, and chic slings to name just a few. The thing about Chihuahuas is that, while they’re small, they can get pretty feisty too. That’s why taking your time to pick out the right dog carrier is essential. After all, you want your Chihuahua to fit snug, warm and comfortable. You also want to be able to control your dog if something happens. That could be another dog causing a scene or a distraction on the street that makes your Chihuahua nervous. Combining safety with all the comfort in the world is crucial. Another factor you’ll want to consider is the price tag. Getting that sense of style at a great price isn’t easy. That’s why we’ve searched for the best products out there for you and your dog. There are many different types of Chihuahua carriers out there. One of the most popular among women is the handbag style. If you want a dog carrier that looks and feels good as you take your best friend around the shops or out to the park, this is perfect. The handbag dog carrier is really for those owners who want to make a personal statement. And there are advantages to them beyond this. They’re usually pretty sturdy, have proper ventilation, and they’re built to last. It looks good enough to be seen on the catwalk over a model’s arm but comes at a price every Chihuahua owner will appreciate. Bellamore has a good track record for stylish and affordable pet products. You’ve got side mesh vents that give your dog a chance to see the world ahead as well as behind, and there are useful pockets for vital equipment such as the dog leash and ball. This is a lightweight handbag style dog carrier that fits the bill and isn’t going to break the bank. It’s also a good option if you’re traveling long distances and want a secure place for your Chihuahua. Find out about the Bellamore Pet Carrier on Amazon! 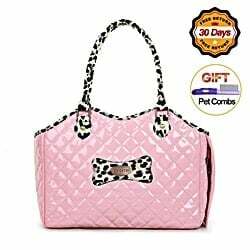 For those looking for a Chihuahua dog carrier that stands out from the crowd, this stylish pink bag is certainly going to catch the eye. It manages to mix elegance with exceptional functionality. Whether you’re going to a get together with friends or out to the mall, you’ll certainly look like a million dollars. Made from synthetic leather, the breathable mesh keeps your dog nice and cool and calm as you hit the streets. There’s a hook for the pet collar and an adjustable strap if you want to carry over your shoulder. 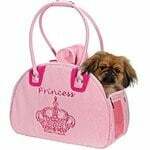 Although it’s aimed at all small dogs, customers have noted it’s an ideal carrier for a Chihuahua. It has plenty of leg room for your dog to stretch out after a hard day barking at the other mutts in the park. It also looks fantastic. Find Out About the Zootop Fashion Dog Carrier on Amazon! 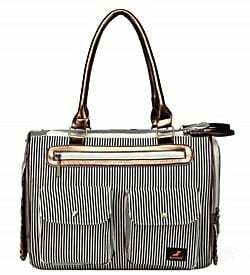 For those who prefer their dog carrier to be a little more understated, this elegant striped bag from Kenox is a superb but still fashionable choice. The bag has plenty of support, so it’s not likely to collapse on your dog once they’re inside like many other bags. The Velcro closer makes it simple to put your Chihuahua in and secure them with the minimum of fuss. According to the reviews, it’s the sort of carrier that small dogs love, whether you’re on the move or not. It may not be as spacious as some carriers out there, but for a Chihuahua, it’s ideal. If you’re heading out for a business meet and the dog needs to go with you, this is the carrier you’ll want. Find Out About the Kenox Tote Handbag on Amazon! Not everyone wants to carry around a handbag when it comes to their favorite dog, however, well it’s made. Chihuahua carrier pouches are one of the best alternatives and also suitable for any guys who have a small pooch in tow. These models of dog carrier generally fit over the shoulder and hang down over the front. There’s a hole for your Chihuahua to poke their head through and watch the world. Many smaller dogs prefer this type of carrier, and it is thought to be more secure by a lot of owners. The brilliant thing about pouch bags is that they are hands-free. You sling them over the shoulder and set off down the road without a care. Available in a whole bunch of brilliant of colors, including pink, red and yellow, this is a great little carrier. It fits neatly over the shoulder and has enough comfort and space to keep your chihuahua happy for long journeys. People often wonder if these are secure, especially when you’re out on the street. The hole for the head can be gently tightened so that there’s no chance of your dog jumping out. Many nervous dogs like Chihuahua prefer these kinds of dog carriers so if you want something all-purpose, it’s a good choice. It also means you’re always facing your dog which can keep them calm. 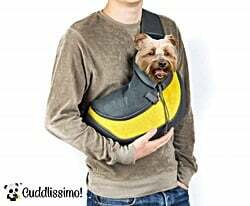 Find Out About the Cuddlissimo Pet Sling Carrier on Amazon! A similar Chihuahua carrier pouch that has got rave reviews is this one from Tomkas. It’s neat, made from machine washable fabric and has plenty of give in it to keep your dog happy all the time. This one comes with a security lock that prevents your Chihuahua from jumping out. The closeness of your dog means that they’re more likely to stay calm as with other products in this genre. 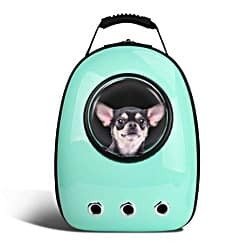 That makes this Chihuahua carrier an excellent choice for fractious pets or those that are a bit too curious for their own good. It’s also another dog carrier that looks good wherever you are. Find Out About the Tomkas Small Dog Carrier on Amazon! 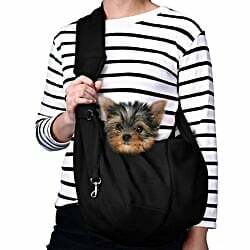 Mixing stylishness with comfort, this chunky sling carrier works for small dogs, including Chihuahuas. With a depth of 9 inches, the shoulder strap makes it a comfortable product for both dog and owner. This is our in-depth review of the Alfie Pet Sling Carrier. There’s a security strap if you’re worried about your dog jumping out the bag. It comes in a range of subtle colors including gray and pink. 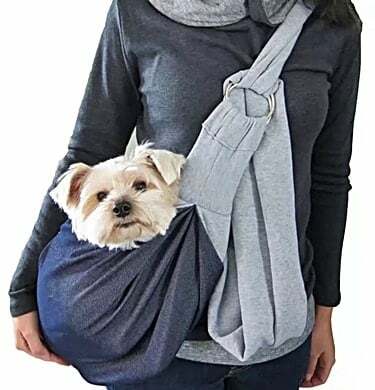 What people like about this kind of sling carrier is that it keeps your dog reasonably loose against the chest so you can keep an eye on it while retaining comfort. If you’re riding a bike, it’s a safe and secure way to travel with your dog. This particular dog carrier also can take a much bigger animal, up to 14 lbs. Most reviewers point to the high level of comfort that makes it just right for small dogs. Find Out About the Alfie Pet Sling Carrier on Amazon! Tote bags for dogs are only a good idea when you have a well-behaved animal that isn’t likely to jump out. They’re also only really useful for short distances. The good news is there are plenty of alternatives. These include Chihuahua sling bags which are have become increasingly popular over the last few years. Almost similar to a tote bag, and perhaps the closest you’ll find on the market, this has a long strap which means you can carry it over your shoulder. The good news is the strap is adjustable which means you can fix it to meet your own preferences. There’s good ventilation, and the ‘windows’ are designed to be claw-proof. It’s a great option if you like to be hands-free while carrying your Chihuahua. 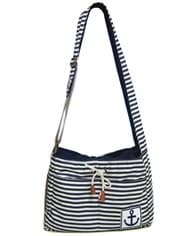 The stylish striped design gives it a slightly nautical bent, and it’s very lightweight and easy to store. 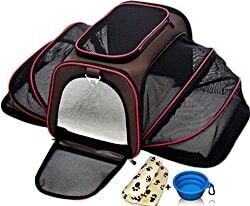 All in all, this is the perfect dog carrier for the park or down on the beach. Find Out About the Rei Pet Sling Carrier on Amazon! Backpacks for dogs are becoming more and more popular. They are lightweight and simple to wear, keep your Chihuahua secure and are easily affordable. The major issue you need to consider is the positioning of your dog as they will most often be behind you. A lot will depend on how your Chihuahua reacts and whether being out of your sight line makes them nervous. We suggest that you try out a friend’s backpack carrier before you finally commit to this type of product. The truth is that most dogs, including Chihuahuas, get used to this mode of travel pretty quickly. So you shouldn’t have too much trouble. These have become a lot more popular in recent times. That might be down to so many millennials using them for practically everything. If you’re looking for an excellent all-round carrier for your Chihuahua, there’s not much to be said against this variety. This is the kind of funky dog carrier that everyone loves. The round window gives your Chihuahua the chance to look out at the world and what’s passing by. It’s also a sturdy looking backpack with a top handle which means you can carry it as a normal bag. It comes in a range of fashionable colors and is eco-friendly to boot. The Anzone Portable is made from polycarbonate plus and has a very comfortable lining inside. The shoulder straps are adjustable and well padded which means they’re comfortable. The waterproof outer shell is also a big bonus if you want to take your Chihuahua out in the rain. All in all, this is a stylish and eye-catching dog carrier. Find Out About the Anzone Portable Space Capsule Backpack on Amazon! If you want a backpack that you can wear from the front, this model from Cozy Cabin may well fit the bill and tick all the boxes. It’s small and comfortable and just the right size for your Chihuahua. Your dog’s head pokes out through a neat opening, and the twin shoulder straps give you a secure fitting across the chest. The front opening can be adjusted using a simple drawstring that is safe and clean. For a small backpack, this is pretty sturdy and great for traveling all over the country. It also looks the part and is easy to store and clean. Find Out About the Cozy Cabin Dog Backpack on Amazon! For those that want something more robust in which to carry their Chihuahua, the Pet Ami model delivers on all fronts. It looks a little bulkier than other products in the same category but provides a comfortable ride at all times. This is ideal if your Chihuahua prefers a little extra leg room. It can double as a carrier for traveling on flights or long journeys. 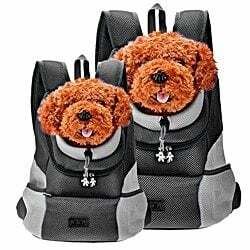 It’s well ventilated with a lot more air flow than other dog backpacks and comes with a strong safety strap. This is the kind of Chihuahua backpack your need to invest in if you’re an outdoors type. It will undoubtedly have a lot more uses than you think and most reviewers find it an indispensable buy. Find Out About the Pet Ami Premium Pet Carrier on Amazon! Traveling to and from a destination on a jet plane can be difficult for pet owners. If you need to take your favorite pooch with you from one city to the next, a good flight carrier for small dogs is imperative. 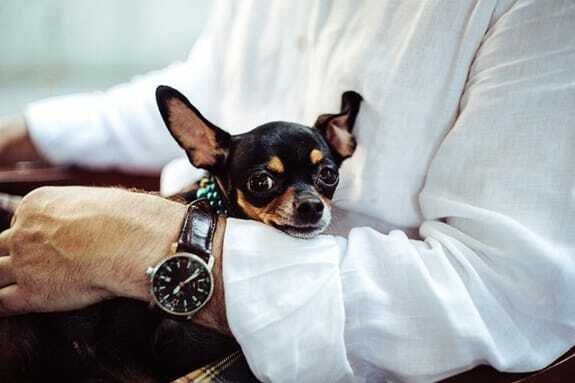 Not only do you want to make sure your Chihuahua is comfortable, but you’ll also be looking for excellent security as well. Many airlines allow small dogs to travel with passengers, but you have to meet their regulations. If this is something you are doing for the first time, make sure you pick the best kind of dog carrier from the start. The good news is there is a lot to choose from if you have a Chihuahua. Sturdy dog carriers can be used for a variety of travel needs apart from flying, and they’re well worth the investment. Should you be searching for something bigger when traveling, this substantial wheel carrier may tick all the boxes. It gives your dog a smooth ride into the airport if you’re about to catch a flight. With breathable mesh on either side, you can be sure that your dog won’t get too agitated once they’re on the road. It can be lifted off the wheels and carried on board with the minimum of fuss. Meanwhile, the comfortable fleece bed will keep your Chihuahua warm and snug. If you’re traveling on an airline, however, make sure you check beforehand that you’ll be able to travel with it. Find Out About the Youthink Pet Wheels Carrier on Amazon! 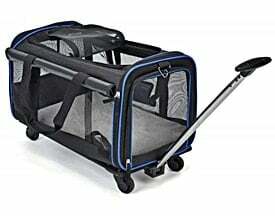 This is an airline approved dog carrier that is lightweight and easy to transport. More like a small overnight bag with plenty of ventilation, it’s ideal for small dogs like Chihuahuas. You put the dog in through the top, and the bag closes securely to make sure there are no mishaps. There’s also a small zipper ‘treat’ window to give you Chihuahua a little something to keep it happy during any flight. 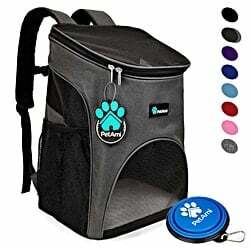 Again, this is also a good dog carrier for other purposes and is easy to store away when you don’t need it. 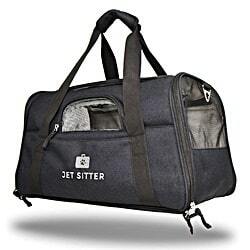 Find Out About the Jet Sitter Super Fly Pet Carrier Bag on Amazon! This has a little something extra compared to other travel carriers for those going on long airline journeys. You can expand the side panels of the bag to give your Chihuahua more room. This is great if you’re stuck in the airline lounge waiting for your flight and pooch is getting a little fractious. With the flaps up, this is a secure and light dog carrier that is perfect for a wide range of travel uses. There’s also a collapsible bowl and fleece mat to provide some extra comfort during the journey. If your dog likes all its comforts, this is the best carrier on the market at the moment. Find Out About the Petyella Expandable Dog Carrier on Amazon! Even if your Chihuahua isn’t a complete novice and is used to being carried around, you may need to train them for a new dog carrier. Select a carrier that fits the bill. Some dogs need more space than others. Shop around and pick something appropriate. The next job once you’ve ordered your carrier is to get your Chihuahua used to it. Place the dog carrier on the floor where they normally hang out. Do this well before you first decide to travel. Stay near the carrier and play with your dog. This helps your Chihuahua associate the carrier with good things. It’s all about creating a positive exposure. The next step is to lure your dog into the carrier. If you leave it open, your Chihuahua may do this of their own accord. Once it makes that jump, you can reinforce the behavior by providing praise and little treats. The key is to put your dog in the carrier for a few minutes at a time so that they get used to it. When your Chihuahua is comfortable with the carrier, you can begin picking them up and carrying them around. You can also introduce a command word and again give your dog a treat when they behave. If you have a sling carrier or pouch, there may be a few issues getting your Chihuahua to go in for the first time. It’s all about being gentle and taking your time because there’s less space. If this isn’t the first dog carrier you’ve had, it shouldn’t take long. Taking your time to find the perfect dog carrier for your Chihuahua makes sense. There are plenty of different products on the market today, and all you need is to match the right one up with your dog. Chihuahuas have an attitude of their own and can difficult to please. Once you find the best dog carrier, however, you’ll discover that your pooch will love it. Then you can take them practically anywhere.